Nakki Lake is a truly beautiful lake, surrounded by the hills of Aravali on all sides, date-palms and Gandhi Ghat garden. Nakki is an ancient lake; it has a legend attached to it. According to Hindu mythology, Nakki Lake was created by the Gods by scooping out land with nails (nakh). The lake was created to live in, as a protection against demons. For this reason, some Hindus even consider it sacred. It is surrounded by hills, parks and rock formations. Toad Rock is a tourist attraction on a hill nearby. 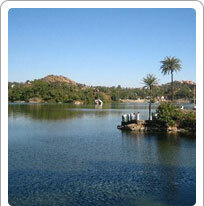 Nakki Lake is the centre of all tourist activity in Mount Abu. Raghunath Temple made in fourteenth century stands nearby. Several maharajas built lavish summer houses around the Lake. It is a large lake, nearly half mile long and quarter of mile broad and 20 to 30 ft. deep towards the dam on the west. The ashes of Mahatma Gandhi were immersed in this Lake on 12th February, 1948 and Gandhi Ghat was constructed, with green lawns, flower beds and fountains, in his memory. In the heart of the Lake, a Jet fountain was installed in 1972 A.D. Coloured water gushes out and is a big tourist attraction.